Neo-Byzantinism [Неовізантизм]. A term for numerous modern variants of art which are influenced, to various degrees, by Byzantine art. In 1910 Guillaume Apollinaire applied the term to the art of Mykhailo Boichuk. 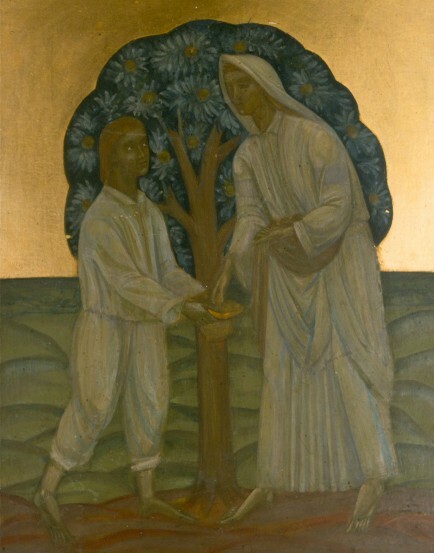 In the 1920s Boichuk and members of his school revived the use of ancient techniques, such as fresco and egg tempera, in their murals. The style prevailing in modern Ukrainian church art, particularly in the West, since the 1950s has been called neo-Byzantine. Among the first artists to work in this style in Western Ukraine were Petro Kholodny, Modest Sosenko, and V. Kryzhanivsky. Other artists whose work can be considered neo-Byzantine have been Sviatoslav Hordynsky, Ivan Dyky, Yu. Mokrytsky, Vasyl Konash-Konashevych, Petro P. Kholodny, and Sofia Zarytska.